They kind of snort, so I guess that’s how Pigfish got their name? The second-most popular baitfish in the Gulf of Mexico is just one letter away from the first (Pinfish). I’m speaking, of course, of the Pinfish. 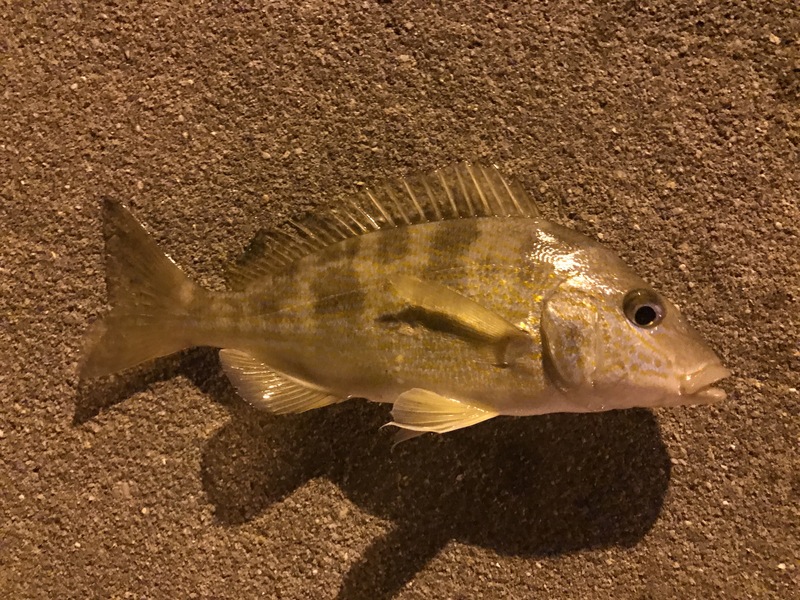 I caught my one and only Pigfish fishing from a public pier in Pensacola minutes after night fell. There were mullet everywhere, as well as small species I still have yet to catch such as a few species of baitfish, Ballyhoo, and Atlantic Needlefish. That was frustrating, but after being approached late at night by some guy in a sweatshirt who was very obviously holding a knife, it was the least of my worries. I watched in horror as a he extended his arm, brandishing four inches of gleaming steel reflecting light from the pier lights. I had some pliers in my bag. Oh! And some scissors. I could fight with that. Maybe I could throw some semi-rancid shrimp in his face, and then lunge with the knife? It wasn’t, and I told him so, visibly relieved as he walked away. A few minutes later, another sketchy-but-not-that-sketchy-for-Florida guy came up to me. He was twitchy and awkward, obviously a tweaker. He told me his car had broken down and asked if I had jumper cables he could borrow. I told him to wait a few minutes, and when he was a good 200 yards away, I went to the car and grabbed them, careful not to turn my back to a Floridian sketchmonger in the dark. I gave him the cables, fully expecting them to be stolen. Fifteen minutes later, he called out “Thanks man!” and left them on my hood. I felt a little bad for thinking the worst of him, but then again, Florida has a reputation, and I’d be stupid not to take precautions. So yeah. That’s how I caught my one and only Pigfish. Read the next entry in #SpeciesQuest here: Species #100 — Gaftopsail Catfish.